SPRINGFIELD, OH — R&M Materials Handling, Inc. added the HoistMonitor to the option list of its RX and QX Quick Delivery offering beginning Dec. 1, 2009. The HoistMonitor Select supervises and records data for planning and scheduling of predictive maintenance, inspections and repairs. This data can then be accessed from the HoistMonitor itself (located in the hoist electrical panel) or from a key pad display in the pendant station with HoistMonitor Plus. 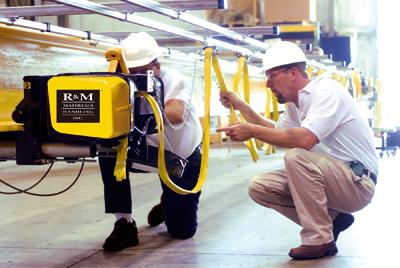 For more information, please visit www.rmhoist.com.